A Timeline is conceptually similar to a Slicer, but Timeline is specially designed to simplify time-based filtering in a pivot table. 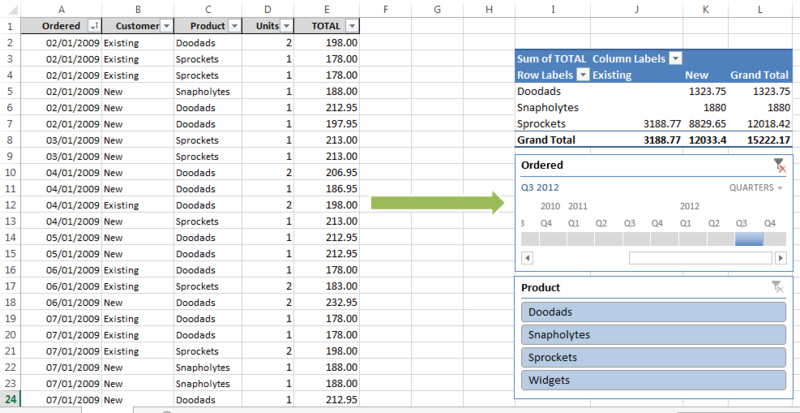 Note: Timeline is a new feature in Excel 2013. You will use Timeline feature only when your pivot table has a field that is formatted as a date. This feature does not work with times. To add a Timeline in your worksheet, select a cell in a pivot table and choose Insert ➪ Filter ➪ Timeline. A dialog box will appear listing all date-based fields. If your pivot table doesn’t have a field formatted as a date, Excel will display an error. The following figure shows a pivot table [click on it to enlarge]. This pivot table is created from the data in columns A: E. This pivot table uses a Timeline. The Timeline in this pivot table is set to allow filtering date by quarters. 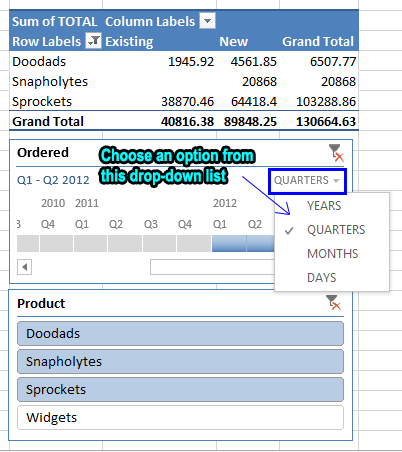 Click a button to view your corresponding quarter, the pivot table will be updated immediately. To select a range of quarters, press Shift while you click the buttons. In the following figure, the pivot table displays data from the first two quarters of 2012 for the products Doodads, Snapholytes, and Sprockets. The timeline is used in this pivot table to filter Date field. At the same time, a Slicer is also used to filter Product field. You can use other filtering options. Click the drop-down menu in the upper-right corner of the Timeline. Other filtering options are Year, Month, and Day. Select an option from this drop-down list to view in the timeline. Both Slicers and a Timeline can be used in a pivot table. In our above example, we have used a Slicer also to filter data in the pivot table. A Timeline has the same type of formatting options as Slicers. You can create an attractive interactive dashboard using Slicers and Timeline that will simplify pivot table filtering.